Text, text, text. Words, words, words. Bo-ring! 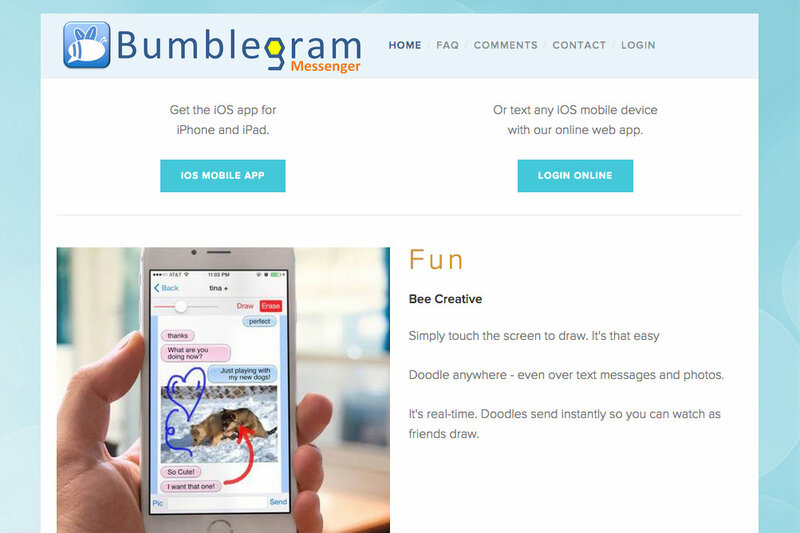 Bumblegram is a messaging app that let’s us doodle within texts, anywhere in the conversation that we like. Draw on the screen, over words, over photos, in real time. No, you don’t need a fancy stylus to draw. No, you don’t need elaborate design tools. Bumblegram works simply. Sometimes collaboration is smooth and efficient – no fancy platform fit for a zillion team members with avatars and loads of features required. Bumblegram is a fun and easy way to communicate. All you need is your finger to draw. Emoji are amazing, but it’s still tough to beat a hand drawn smiley face. With Bumblegram you can enjoy watching your friends doodle before your eyes or write things back and forth to one another. Who wants to look at the screen waiting for the dots that tell us that someone is typing to turn into words? No one. Far more exciting to watch scribbles materialize as they’re being drawn or written. Anyone up for a game of tic-tac-toe? Bumblegram lets us tap into both our silliness and imagination. To be fair, Bumblegram also helps out conveying serious information as well, but in simple and easy fashion. It’s a fast and effective annotating tool. Want to direct someone’s attention to something specific in a photo? Draw a quick circle around it, and the important detail becomes clear immediately. If you ever have to file an insurance claim, Bumblegram would be a useful tool for highlighting damage to your car or home directly on a digital photo. Need to ask a doctor about a spot on an x-ray? Give the mark a quick circle and send it along – or at least you have your photo marked so that you can easily show what it was you wanted to mention when you go to your next appointment. Giving instructions over the phone proves comically difficult at times. Ever been asked to search for something for someone out of the house? It’s nearly impossible to find the object in question. With Bumblegram, you can snap a picture and the other person can illustrate exactly where it is, or realize that the person at home is telling the truth quickly – what they’re after is indeed somewhere else. The great thing about an uncomplicated tool like Bumblegram is that it can serve several purposes – fun, improving work productivity, etc. People find their own uses for such an open app, and creativity goes unchecked. 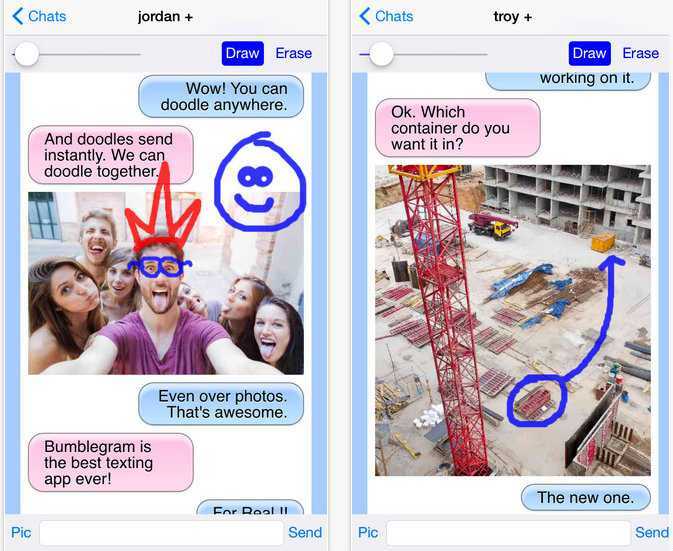 Ready to color your conversations by drawing on the screen? Learn more about how Bumblegram messenger works at bumblegram.com or download the app from the App Store.